Monitor photo A city crew pulls a concrete box containing a time capsule from the ground Wednesday near the Mayor Joe V. Sanchez Public Library in Weslaco. 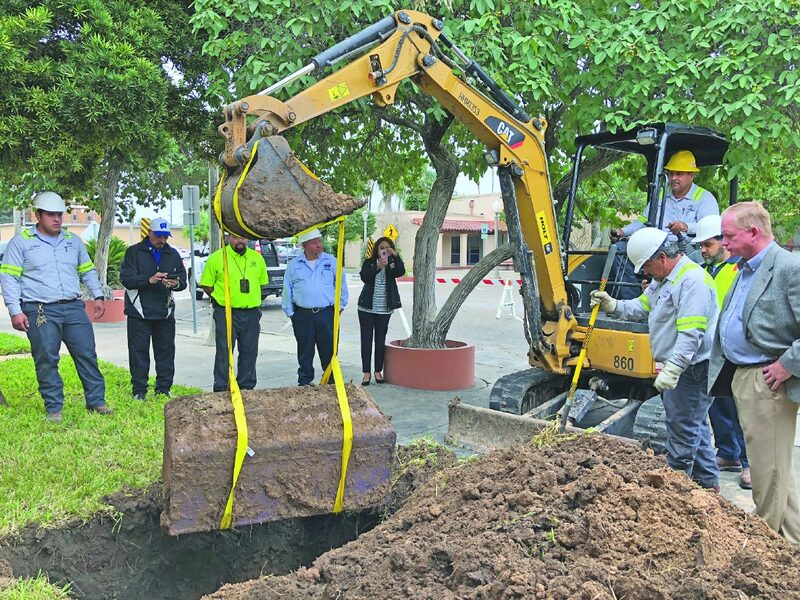 WESLACO — Public works crews on Wednesday morning unearthed a time capsule buried 24 years ago near the Mayor Joe V. Sanchez Public Library. In 1994, city workers placed the time capsule about five feet underground. On Wednesday, a different crew removed it, a year ahead of the planned excavation date. Public Works Director Lupe Garcia, a longtime city employee who was present for the burial of the capsule, said students from schools in the community placed items inside it. The concrete box will be opened Monday, Dec. 10, at the Weslaco Museum of Local History and Cultural Art to kick off the Weslaco Centennial celebration. The city was established in 1919. Relics inside the box will be displayed at the Weslaco museum beginning in January 2019.